Although issues with low inventory and fast-growing home prices still abound, the market has greatly improved since the housing bubble in 2006, and the latest foreclosure rates prove it. In 2017, residential home foreclosures fell 27 percent to 676,525 — the lowest level since 2005, according to a recent Experian report. “Thanks to a housing boom driven primarily by a scarcity of supply, which has helped to limit home purchases to the most highly qualified — and low-risk — borrowers, the U.S. housing market has the luxury of playing a version of foreclosure limbo in which it searches for how low foreclosures can go,” Attom Data Solutions SVP Daren Blomquist told Experian. Western and Plains states have fared the best since 2005, thanks to affordable home prices, healthy jobs markets and relatively low costs of living. RealtyTrac foreclosure data for April 2018. Click the graphic to see more. As of March 2018, only one in every 11,082 homes in South Dakota are in foreclosure, and only 0.01 percent of residential properties in the state are in foreclosure — 0.05 percent below the national average. According to Experian, an unemployment rate of 3.4 percent is key to South Dakota’s success. “A below-average jobless rate is key in reducing statewide foreclosure rates, as the more people who are gainfully employed are less likely to have their home fall into foreclosure,” the report notes. Just like it’s neighbor to the south, North Dakota has an enviable foreclosure rate with only 1 in every 10,824 homes being taken back by the bank. The state has robust jobs growth, as energy companies flock to North Dakota and bring a wealth of job seekers and potential new homeowners. As a result, current homeowners who would’ve gone into foreclosure can quickly sell their home for a great price. Vermont is an outlier in the East Coast — according to RealtyTrac, New Jersey, Delaware and Maryland have some of the highest foreclosure rates in the country, with as much as 1 in every 605 homes being in some stage of the foreclosure process. Only 1 in every 7,176 homes are in foreclosure in the Evergreen state and its unemployment rate is at 2.8 percent, meaning that homeowners are more likely to keep up with their mortgages. Thanks to strong buyer demand and home price appreciation values that are expected to grow by 3.6 percent by 2019, only 1 in every 6,384 homes are in foreclosure in West Virginia. But Experian warns that foreclosure rates may start to increase due to an unemployment rate (5.4 percent) that eclipses the national average (3.9 percent). Only 1 in every 6,277 homes in Montana are in foreclosure, making the state’s foreclosure rate 0.02 percent below the national average (0.06 percent). Homeowners in the Treasure State are also benefitting from a 10.8 percent growth in home values since 2016, giving struggling homeowners the opportunity to sell their homes and avoid foreclosure. The ATTOM Data Solutions (RealtyTrac’s parent company) provides a count of the total number of properties with at least one foreclosure filing entered into the ATTOM Data Warehouse during the month and quarter. 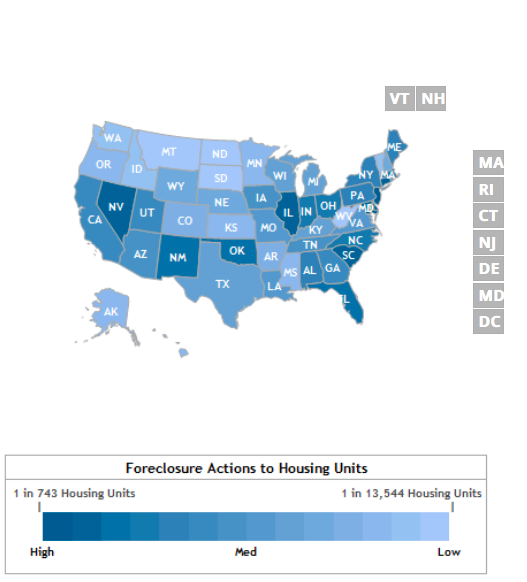 Some foreclosure filings entered into the database during the quarter may have been recorded in the previous quarter. Data is collected from more than 2,200 counties nationwide, and those counties account for more than 90 percent of the U.S. population. ATTOM’s report incorporates documents filed in all three phases of foreclosure: Default — Notice of Default (NOD) and Lis Pendens (LIS); Auction — Notice of Trustee Sale and Notice of Foreclosure Sale (NTS and NFS); and Real Estate Owned, or REO properties (that have been foreclosed on and repurchased by a bank).